Here is a sweet potato casserole recipe I created several weeks ago. 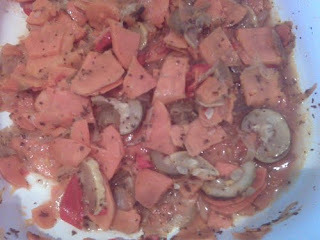 All sliced in food processor--sweet potatoes, green and red bell peppers, onions, green and yellow zucchini. Add parsley, balsamic vinegar, olive oil and so me brown sugar or agave nectar to taste enough for a slightly sweet but tangy flavor. Bake in oven 30 minutes. Salt and pepper, of course, and I don't remember what else, but will officially type this into a recipe form in the days to come. Enjoy!